For as much as I love baking and for as often as I do it, it’s surprising that I am not really a “dessert person.” I enjoy desserts every now and then, but I never deliberately leave room for them when enjoying a meal out. I would way rather eat more steak than save myself for a brownie a la mode. So on the rare occasions when I do have dessert, I usually make a meal of it…going out specifically for that dessert. And who does desert better than the French? So I set out to find some French bakeries in the Miami area, and after trying several different ones, I believe that I might have finally found the best. It is called Le Royal Bakery and it is located in a little shopping center near Sunset Shops. I stumbled upon this little gem while walking back to my car after having lunch at a French restaurant that is in the same shopping center (Café Pastis, which is a-m-a-z-i-n-g). Since I had just eaten, I wasn’t hungry when I walked by Le Royal Bakery, but I got one glimpse of the croissants and my feet involuntarily carried me inside. The inside is nothing fancy, but the display case is quite impressive. 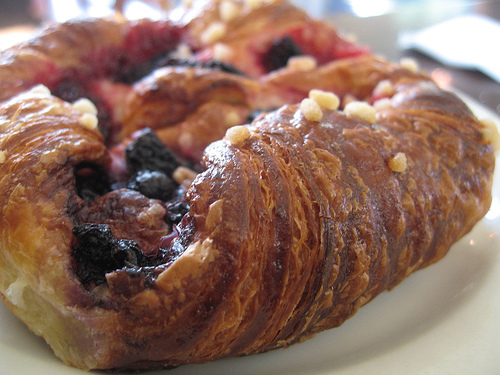 There are like 6 different types of croissants and 10 different varieties of fruit tarts daily. Of course this is in addition to the abundant assortment of breads, brownies, cakes, danishes, and cookies. I love the Almond Croissant and the Cream Cheese Croissant. The almond paste and cream cheese help keep the inside of the croissant moist, while the outside is soft and flakey. The Plain Croissant is also very good and buttery, and I love to drizzle a little honey and raspberry preserves over top of it when I eat it. I go for a croissant and coffee here about 1-2 a week in between my classes! They are very addicting and oh so cheap! I always feel like I’m getting ripped off at French restaurants because the food is usually so over-price (as if something expensive is intrinsically delicious), but this no frills bakery has cheap, not modest, but cheap prices! A specialty croissant is just $2.50. But beware, although they accept credit cards, there is a $10 purchase minimum, and this equates to a lot of treats there so bring cash! I learned the hard way (aka delicious way) on my first visit and ended up purchasing like 3 croissants, 2 fruit tarts, and a macaroon. I never bring cash and just use it as an excuse to treat myself to indulgent pastries. 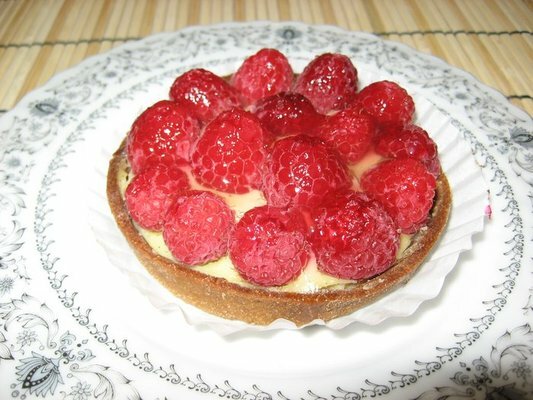 Out of the tarts, I have tried the Raspberry Custard Tart, which is a buttery piecrust filled with custard and topped with fresh raspberries. Oh my goodness is it good! Its actually an experience. This is not something you eat with one hand as your driving in your car, this is something you sit down and devote a blissful 5 minutes to eating. You need to fully enjoy the experience of this dessert. I have also tried the Blueberry Tart, which has an almond cream filling, but I thought the Strawberry one was better and this is surprising given my love for almond flavoring. The Macaroons are also incredible, and traditional French style. Apparently, they also serve sandwiches for lunch that cost only $5.50. I have never had one, but I hope to try one soon! You must try this place for yourself!